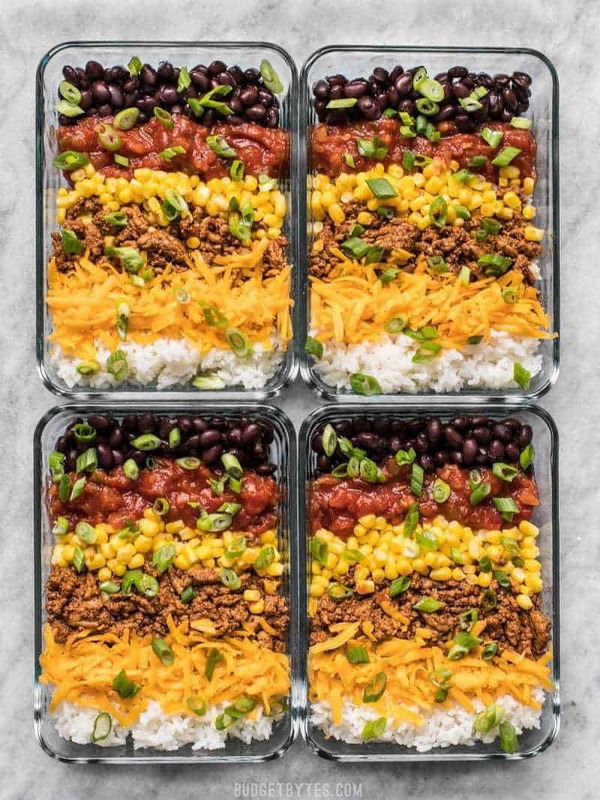 I have really been craving burrito bowls, so I decided to highlight them in the meal prep series this week. 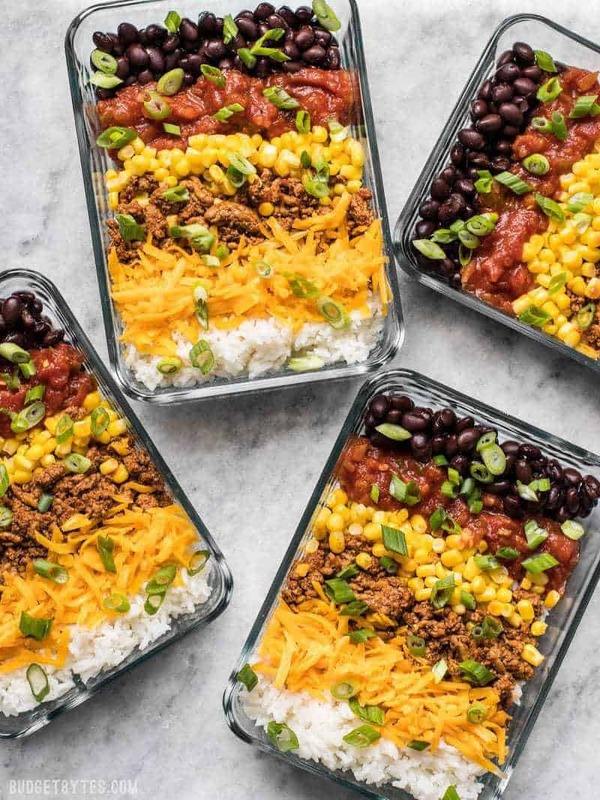 If you’re a meal prep pro, you’re probably very familiar with burrito bowls. They’re often the first meal the people learn how to meal prep because they’re just so easy and versatile. Despite being kind of a meal prep no-brainer, I’ve decided to feature them here for all my meal prepping newbies or those who are still just thinking about venturing into the meal prep world. 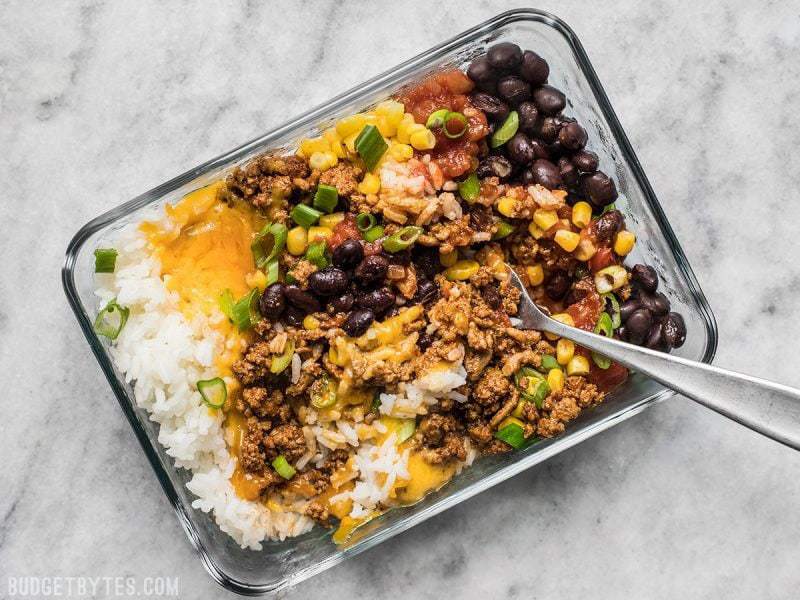 I’m calling these the Easiest Burrito Bowl Meal Prep because this version requires the least amount of work, no ingredients packed alone or on the side, and nothing to get soggy or limp as the bowls are stored in the fridge. This is where you start and I’ll provide some suggestions for customizing or taking your burrito bowl meal prep to the next level below. 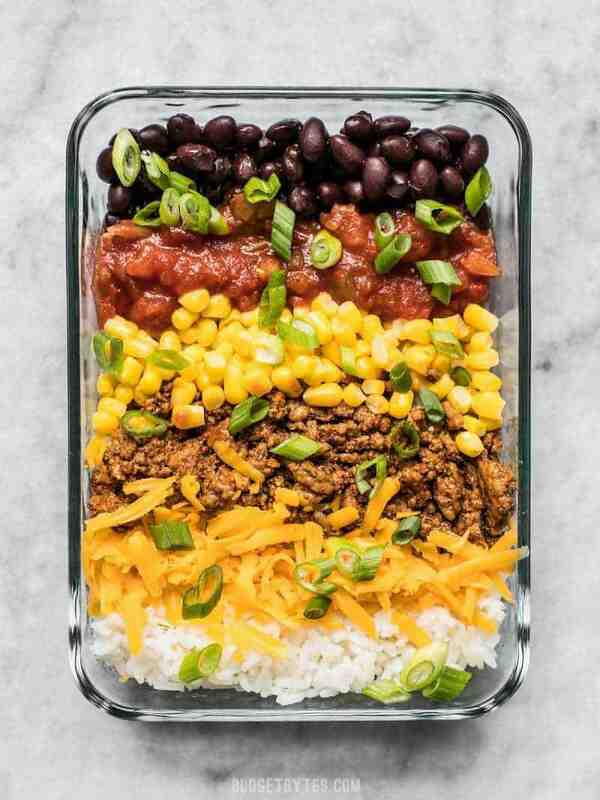 As I mentioned above, all the ingredients in the “Easiest” Burrito Bowl Meal Prep can be stored in one container without fear of anything getting “yucky.” You can prepare this meal in about 30 minutes and there is only one item that requires slicing. It’s really that easy. 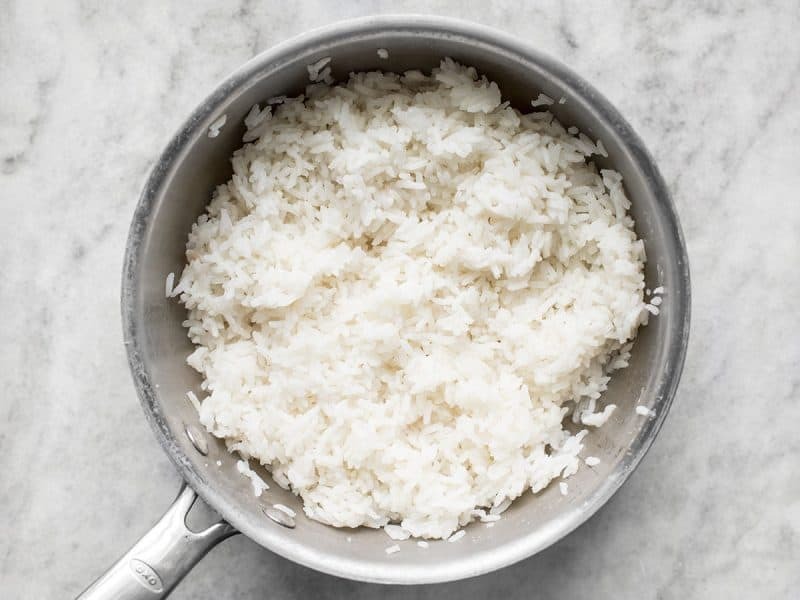 You can use brown rice to make things a bit healthier, or even quinoa. And of course, you can adjust the portion of any of the ingredients to meet your taste buds or dietary needs. 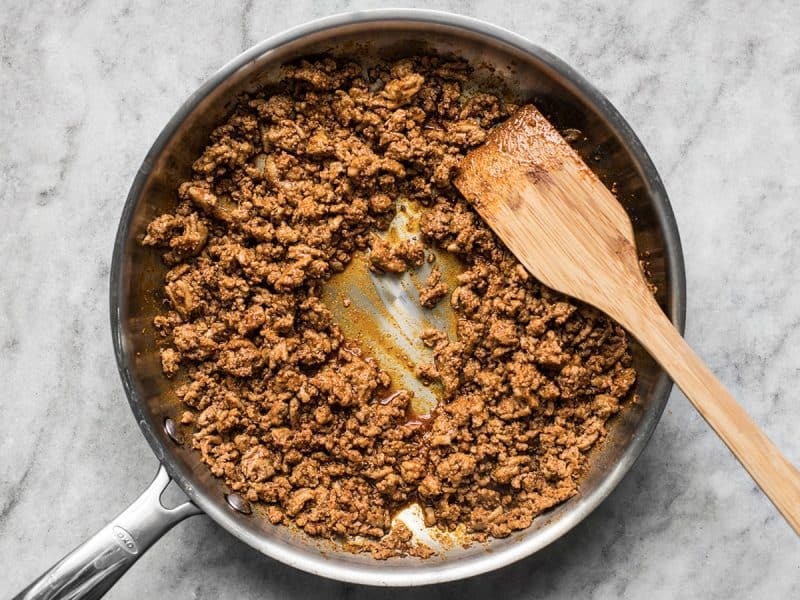 While the rice is cooking, prepare the taco meat. 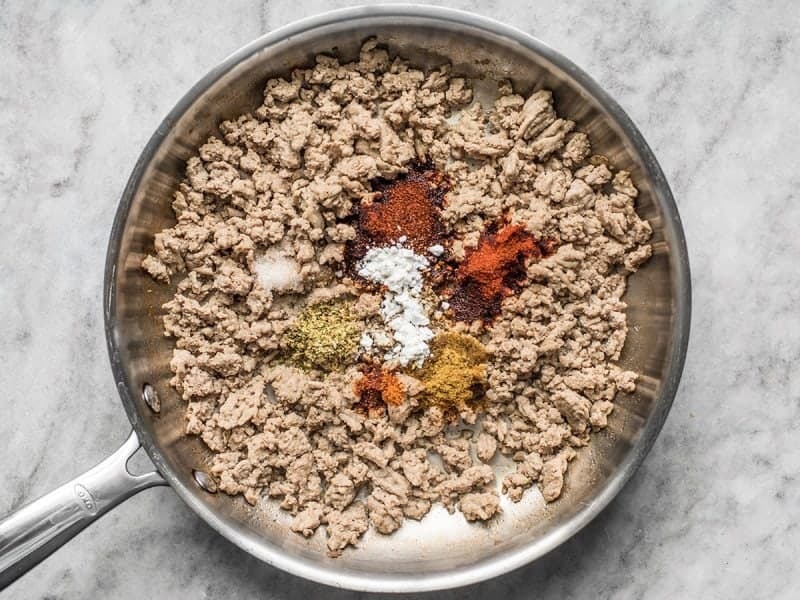 Cook one pound ground turkey or beef in a large skillet until it’s cooked through. Add the taco seasoning and a 1/2 cup water, then simmer until it’s reduced to a slightly saucy consistency. I used my homemade taco seasoning blend (with cornstarch), but you can use a store-bought packet of taco seasoning. And this is what it looks like when it’s finished. Set the meat aside. Then prepare and gather the rest of the burrito bowl ingredients. Thaw 1 cup frozen corn kernels, rinse and drain one 15oz. can of black beans, shred 4 oz. of cheddar, gather 1.3 cups salsa, and slice two green onions. 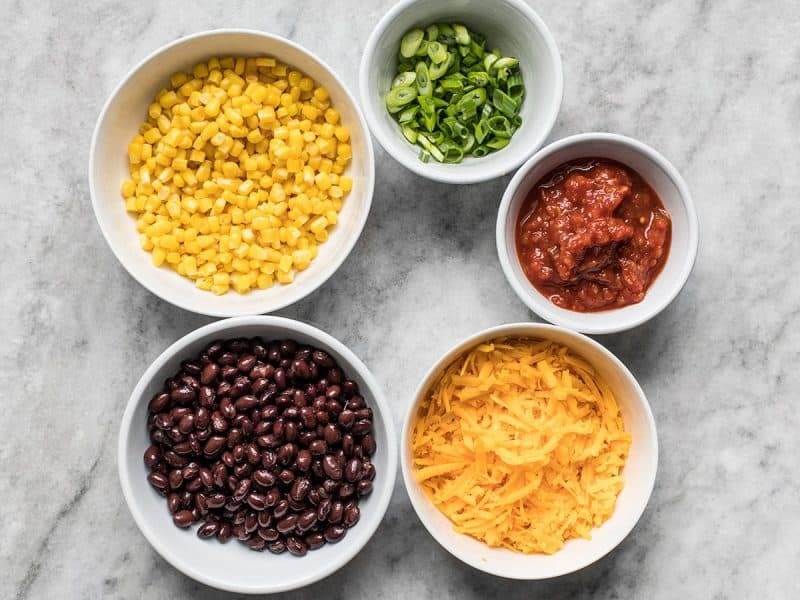 Have never done meal prep or burrito bowls before, just have a question – is there a reason you have all the ingredients separated within the containers when you store them? Does it get soggy if you mix it all together to store? It was really just for illustration purposes, so people can see what’s in them. The cheese may absorb some moisture from the salsa if it’s all stirred together, but that wouldn’t matter if you plan on reheating it because the cheese will just melt. made this twice now and it’s great! thanks for the awesome tips – I’ve been trying to get better at cooking and your site is great. I am so happy I found this site! My hubby is a very picky eater that has maybe 5 foods he likes to eat. I’ve been slowly introducing him to new foods and getting creative and this site has helped me tremendously with ideas. This burrito bowl is another hit that has pleased everybody. Thank you for the clear pictures and concise techniques that makes these recipes easy to replicate. These flavors come together for a really filling and satisfying meal with enough leftovers to have a nice nacho appetizer/snack later. Do you think these would freeze ok? I appreciate that it makes four servings but I don’t want to eat it four days in a row. Loving your site, btw! Yes, I’ve frozen dishes very similar to this and they reheated well. I will definitely be making this again. Perfect proportions, quick and tasty. I made this again!! It has become my favorite lunch!! Just wanted to say how much I love these meal prep posts — I’ve been making my week’s lunches in advance for well over a decade, but you’ve been giving me lots of ideas for how to expand my rotation. These were so good I actually made them two weeks in a row! I’m a vegetarian and substituted Trader Joe’s Beefless Ground, but I bet their Soyrizo would be great too. Since TJ’s meat substitutes come precooked, the only thing I needed to bust out the oven for was the rice. Thanks again for the fresh ideas! Just bought the ingredients and rubber make containers. Will be my first time doing meal prep! I am excited!How long can you refrigerate these? I like to keep it to four days, max.